A management buyout has injected a multi-million pound investment from Rutland Partners into Aston Barclay Group. Led by new chief executive officer, Neil Hodson, the MBO, details of which have not been announced, will see a new 18-acre Super Centre open at Donington Park in Q4 2017 to serve as Aston Barclay’s central hub for all remarketing operations, as well as being the home to a new buyer services and account management team. Investment is also being made in existing centres, new IT technology and the development of its people. Glenn and David Scarborough, formerly group managing director and commercial director respectively, will both remain company shareholders as non-executive directors. 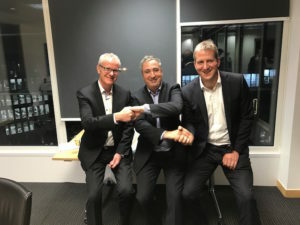 “With Glenn and David staying on-board, Aston Barclay’s family-run approach will remain at the heart of our offering for customers – a friendly, consultative and personal service with a board and senior management team always on hand to work closely with our buyer and vendor partners,” added Hodson. Laurence Vaughan is also joining the Board and investing as non-executive chairman. Vaughan was previously CEO and now non-executive chairman of Sytner Group. Aston Barclay has also restructured its senior management team, with Martin Potter joining the board in the position of group operations director. Potter is supported by national operations manager Brett Henderson, while a new sales director will be joining the board in the near future. Stewart Ford, previously at CAP HPi, has also been appointed as group IT director and will spearhead the investment in Aston Barclay’s digital strategy which will be at the heart of every auction centre.